Between 1575 and 1577 Venice was hit by the most terrible plague after the one happened in 1348. Around 50000 people died. They were about one third of the venetian citizens. In order to beat the plague, the city decided, only in a second time, to move all the infected. All the suspects were moved to Lazzaretto Nuovo in the first place and then to Lazzaretto Vecchio if they were found infected. As they were thousands, the senate decided to hoard the infected inside some boats docked near the two islands. This paiting shows the plague that hit Venice in 1575. On 4th September 1576, the Senate of the Serenissima republic decreed to built a church in the name of Christ the redeemer as thanks for freeing the city from the plague. The first stone was laid in 1577. The project was commissioned to Palladio. The Redentore Church, built by Palladio at the end of the 16th century. On July 20th of 1577, in order to celebrate the end of the plague, was built a bridge made of boats to reach the spot where the Church was being built. The third Sunday of July we still celebrate Redentore Feast. In the night between Saturday and Sunday takes place a show of fireworks in Saint Mark’s Basin and on Sunday take place instead three regattas with traditional boats. Do not lose this opportunity! 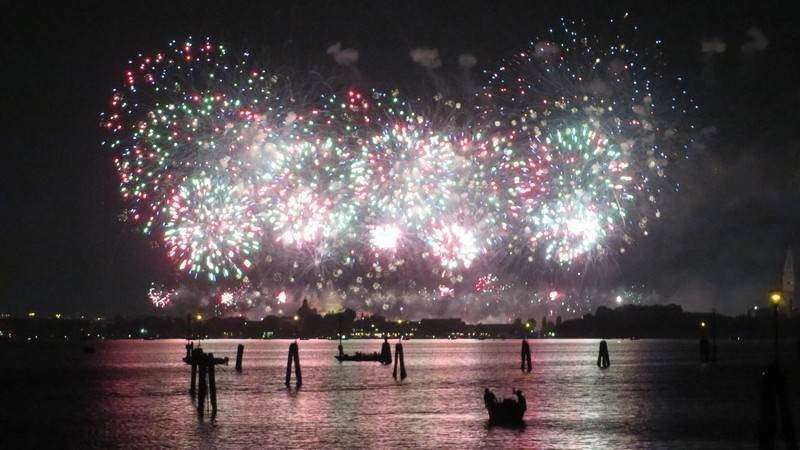 Live the fireworks from Hotel Bucintoro, directly from your room!